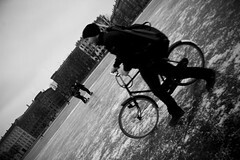 'The Lakes' in Copenhagen are frozen and Copenhageners are enjoying the ice in great numbers. 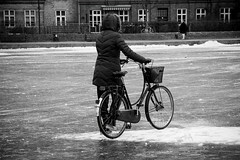 The last time the ice was thick enough that the City allowed people onto it was in 1996 - bloody global warming - so at all times of the day there are people out on the ice. 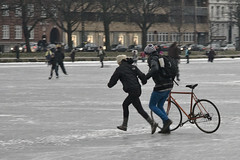 Especially on the weekends there are wonderful crowds of people skating, walking, cycling, sledding out on the suddenly liberated real estate. Or just people taking a shortcut from one side to the other. The Lakes used to be a river valley outside of the citys walls. In 1523 it was decided to exploit them and dam them to create an outer line of defence in case of attack by land. 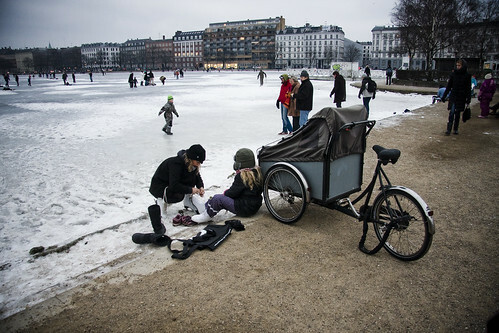 They gradually morphed into their current form through the centuries and are now an integral part of city life with pathways along all the banks. 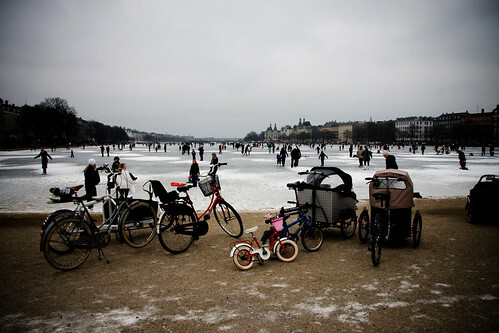 The thing that hits me when The Lakes are frozen over is how much real estate is suddenly available to the citizens. I have no idea how many square metres we're talking about, but you really get the sense that the city has suddenly grown. Standing on the ice in the middle of one of the lakes you experience views that are otherwise unaccessible. The inner and outer harbour and the beaches surrounding the city are far more accessible to the citizens, be it swimming, sailing, canal boats or private motor boats or sailboats. The Lakes, on the other hand, are more of an aesthetic feature. You rarely use the water. On one lake there are pedal boats for rent, but that's about it. 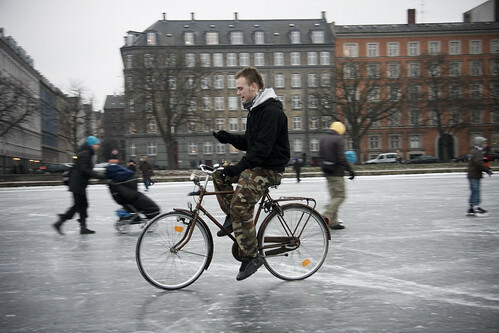 So it's understandable that Copenhageners are loving the chance to use the ice. Even if it's just for sending text messages while cycling. 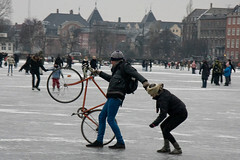 Or running along and then sliding. Just for the pure fun of it. Given the strong identity of The Lakes on the urban landscape of the city, it is amazing to think that they were very well close to being paved over, at least in part. In 1958, City Plan West was proposed. It basically involved building a motorway - The Lake Ring or Søringen - along the stretch, narrowing The Lakes by 30 metres. 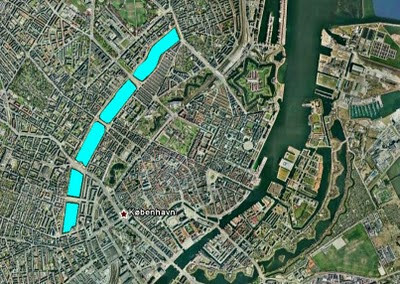 Furthermore, the massive motorway would have featured a hub in the Vesterbro neighbourhood. 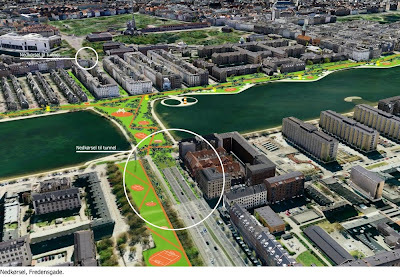 In fact, the plan called for levelling much of Vesterbro - a working class neighbourhood - and replacing it with a blade runnerish modern neighbourhood with skyscrapers, inspired by London City. The police station on Halmtorvet is actually the first building to be erected according to the plan. That's how far the City Plan West actually got. Which is kind of scary, really. Actually, the plan was finally killed off for good in 1973 and thank Odin for that. The Lakes, while an attractive pearl around the neck of the inner city, still dont' really live up to their potential. There is still too much traffic along the one side, with too many large trucks taking a short cut through the city. Late last year a Danish architecture firm, Christensen & Co. launched a bold proposal to give the area along The Lakes more life. It involves burying the busy roads and building underground parking in order to liberate the sunny side of The Lakes and create parkland and pathways, among other things. They have a blog about the project, in Danish but with loads of illustrations. 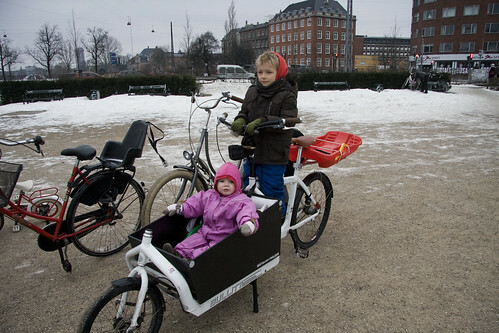 Two kids [Felix loves standing up, straddling the crossbar], two sleds [one on the back rack, one in the cargo box with Lulu-Sophia on it], two skates for my feet and one Wifealiciousness on her own bike.